Thanks to horror host Hilary Barta for keeping track of my various contributions to LimerWrecks, currently concluding an epic limer-trek through the Universal horror cycle. Things Roddy said during Dracula Has Risen From the Grave. A specific example of the limits of conceptual knowledge in WMS is from a reported instance of a 21-year-old woman with WMS (Verbal IQ of 69) who was literate and read several books on her favorite topic: Vampires. When this subject was asked what a vampire is, she responded reasonably and clearly that a vampire is ‘‘a man who climbs into ladies’ bedrooms at night and sinks his teeth into their necks.’’ When asked why vampires do that, she thought for a bit, and then said, ‘‘Vampires must have an inordinate fondness for necks’’ (Johnson & Carey, 1998). Roddy says this once during every screening of a Christopher Lee DRACULA film. Lee is his favourite vampire, and we’re pretty sure the attraction is the sexual fascination Lee’s Count is able to exert over every blonde he encounters. Roddy does not exert this fascination, but would probably like to. Wouldn’t we all? Roddy himself watches quite hypnotized, becoming antsy and talkative only when the suspense builds. But the boring scenes with Barry Andrews keep him hooked too, since it’s always possible that something more vampiric may happen at any moment. This movie has a fair bit of tedium, but director Freddie Francis contrives some lurid and Bavaesque colour effects, which seep in whenever Lee is around. Unfortunately, nothing but verbiage seeps in when Barry Andrews and Rupert Davies are around. People with Williams consistently interpret faces as being friendlier than the rest of us. Here, Roddy seems to be unsure who he’s rooting for, shouting helpful advice to Dracula as well as to the heroes. But he knows pretty well who the goodies and baddies are. The character of the unnamed priest (Ewan Hooper) who gets enslaved by Drac is a puzzle, though. Characters who behave inconsistently are troubling. I try to explain to Roddy that no, he hit the man he was aiming at, but he doesn’t understand Hooper’s two-faced Renfield persona. People with Williams Syndrome are extremely sociable and tend to think the world is their friend, until proven otherwise. If you say to a child under three, “A little boy has some sweeties, and he hides them under a bowl, but when he’s away his mummy moves them and puts them under a cup. When the boy comes back, where will he look for his sweeties.” Younger children always say “Under the cup,” because that’s where the sweeties ARE, and they can’t grasp the fact that the boy has different knowledge from them. That’s theory of mind. 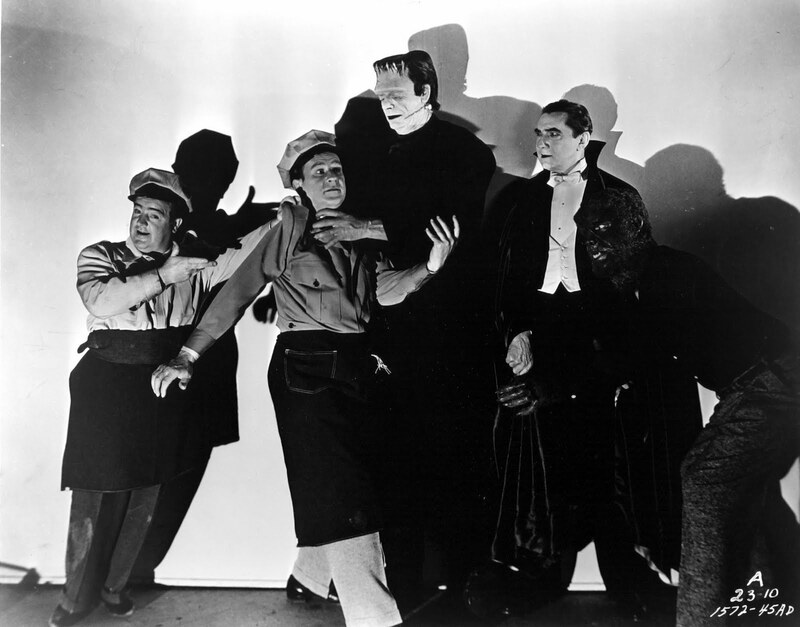 When we watched ABBOT AND COSTELLO MEET FRANKENSTEIN, Roddy became frustrated by the character of the policeman, who didn’t know that Lon Chaney was the Wolfman. I tried to explain that the policeman didn’t know that fact, but no matter how I tried to express it, Roddy thought I was claiming that Lon Chaney wasn’t the Wolfman. “I’m sure Lon Chaney is the Wolfman,” he muttered, repeatedly. Tests have shown that Williams people are very attentive to faces, when watching TV or otherwise. This close concentration seems to be connected to a difficulty in interpreting the meaning behind facial expressions. Because the condition involves high levels of sociability, Williams people concentrate very hard on the faces, trying their best to make out what the expressions mean. Concordantly, Williams people aren’t much interested in cartoons. Roddy loves slapstick stuff where people without learning difficulties fall down or bump their heads, thus losing their supposed sense of superiority, but cartoons aren’t interesting, presumably because the faces don’t have enough detail of expression. Roddy’s generally very good at recognizing people’s faces — that seems to involve a different part of the brain. He did think the CGI Jim Carrey in A CHRISTMAS CAROL was “that man from that programme with the horse” — Wilfred Brambell in Steptoe and Son (but what other real human being ever looked like that? ), and he did think Veronica Carlson in this films was a presenter from 70s children’s show How, but that’s not so unreasonable: Jenny Hanley’s appearances in SCARS OF DRACULA did not prevent her co-presenting Magpie on Children’s telly in the seventies.